Tasky is a simple cross-platform todo/task application sample that allows you to track todo/task items. Tasky supports iOS and Android - each with a native UI written in C#. Common code lives in a Portable Class Library, which is referenced by each application project. It uses a local SQLite database to store the tasks, which are saved and read using the SQLite-PCL NuGet package. This project type requires Xamarin 3 (Xamarin Studio 5.x) or Visual Studio 2013 with PCL support. It requires an Indie licence (or start a free Trial) of Xamarin. 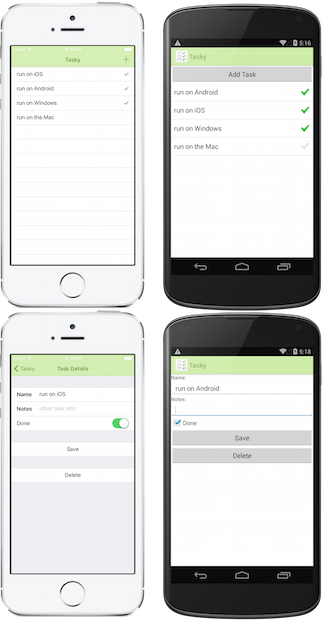 The equivalent app written with Xamarin.Forms is called Todo.